In San Francisco, the former site of the Hunters Point shipyard is now being developed with over 10,000 units of housing, 2.6 million square feet of office and R&D space, and about a half million square feet of retail. The project will also include about 75,000 square feet of maker space, or less than 1% of the total building area, most of which will probably go to artisanal firms making food, fashion and furnishing, things like beer, bread and bicycles, sold to the upscale consumers of the region. Meanwhile, in San Leandro, about ten miles almost directly east across the bay, there's something far more significant going on: an under-the-radar renaissance of industrial production, in which companies making state-of-the-art products sold around the world are taking over factories and warehouses. The Hunters Point redevelopment is an extreme example of gentrification, the conversion of a former jobs center to "hipster" uses. In contrast, the next-generation industry in the East Bay brings new money into the local economy and creates skilled, middle-class jobs. If we want to get more of the latter, we need to understand and support what is going on there. This new generation of industry is not so much mass production as the prototyping and fabrication of custom and semi-custom parts using advanced materials and machinery. A lot of those old manufacturing jobs were dull, dirty and dangerous, to say nothing of downsizing and wage cram-downs. This new generation of industry is very sophisticated, and pays far better. San Leandro has 40 to 50 of what we might call these "cool companies", which make specialty goods, generally with between ten and 100 people. Examples include PCC Structurals, which casts and machines titanium-aluminum turbine blades, tank parts and medical prosthetics; Energy Recovery Inc., which makes heat exchangers for water purification and the energy, oil and gas industries; and Halus Power, which rebuilds medium-sized wind turbines to make them more efficient. In an old Dodge plant nearby, dozens of small 3D printing, hardware and other tech startups have taken over 200,000 square feet space. That space is roughly three times as large as the new industrial space planned for Hunters Point. These next-generation industrial companies include both the new and the well-established. The older companies have survived not just by luck, however, but by updating their management, marketing and machinery. What really sets them apart is engineering and precision. Scandic Springs, for example, makes small metal contact points that go into Cisco routers and Teslas. Scandic ordered its stamping machine from northern Europe, but when it needs more technicians, it goes looking in places like Detroit and the former jewelry district of Providence, where people understand metallurgy. In 2013, a team of MIT researchers studying industrial production ("Production in the Innovation Economy", www.mit.edu/pie/) found that the biggest problem for America's manufacturing companies, most of them small and medium-sized, is being "Home Alone", or isolated from others with whom they can collaborate and share knowledge. Looking at German success, especially the Mittelstand companies, MIT wrote, "It is impossible to understand the different fates of manufacturing in the United States and Germany without comparing the density and richness of the resources available in the industrial ecosystem across much of Germany to the thin and shrinking resources available to U.S. manufacturers across much of this country..."
In the Bay Area, that industry ecosystem still exists, and includes not only software and electronic components, but also bio-pharmaceuticals, bio-energy, and medical devices. At a conference on building local industrial community in the East Bay, Scandic Springs CEO Hale Foote said that Nevada tried to lure his firm out to the desert, where many of his operating costs would have been much lower, but that move would have deprived is company of access to this industrial ecosystem. MIT researchers noted that German companies have learned to sell their capabilities across a variety of industries, transforming "old capabilities and their reapplication, repurposing, and commercializing... from autos to solar modules, from semi-conductors to solar cells, from machine tools to make spark plugs to machines to make medical devices like artificial knees." Scandic defines itself by its expertise, metallurgy, and not as an electronics or auto industry supplier. 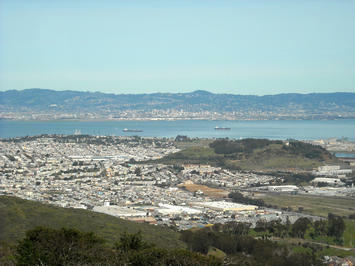 First-ring industrial suburbs like San Leandro provide access to this ecosystem. San Jose (traffic permitting) is a half hour south, Berkeley 20 minutes north, and San Francisco 25 minutes west. There are two BART stations a ten-minute drive away, and an old downtown main street and streetcar neighborhoods nearby. By Bay Area standards, the old buildings near the central East Bay waterfront are very affordable, about half the cost of those in Berkeley and Emeryville, where software and biotech companies have bid up values. Seemingly every city now wants an "innovation district" like Mission Bay in San Francisco, South Lake Union in Seattle, or the Seaport District in Boston, but those places are only affordable to well-capitalized firms and lack the flexible workshop space needed for design and fabrication. This kind of industrial renaissance is underway in Boston and LA as well. About a ten-minute bike ride north of MIT, in Somerville, a host of industry start-ups have taken over an old envelope factory, the Avery Business Center. These companies couldn't afford space in Kendall Square, but ventured further north and took space together. Now there's also a hardware incubator there, Greentown Labs, backed by organizations like DARPA, the DOE, and Shell. There are more places like these coming. On the West Coast, expect to see these urban industrial companies locate in Vancouver BC's South False Creek and Strathcona neighborhoods, Seattle's Georgetown and SoDo, Portland's Central East Side, and south and east of LA's Arts District. That industry has already gone between downtown LA and LAX, with SpaceX locating on Rocket Rd. in the industrial suburb of Hawthorne. One of the central questions is how skilled technicians, not engineers, but production workers can afford to live within reasonable commute distance of these places. One answer is that these jobs pay well enough for workers to live nearby, or to endure a moderate commute. For skilled machining, the jobs can easily pay $50,000 to $100,000 a year. That has helped companies like PCC Structurals lure machinists out from Detroit. A looming question is what these companies will do when the Baby Boom dies out. At that point, they will need to hire skilled younger people, something they have had a hard time doing so far. For example, when Bayer wanted to expand its biopharmaceuticals production in Berkeley, it could not find enough technicians. That expansion instead went to Germany, the loss of a new $700 million investment. There is so little attention to industrial production in the Bay Area that that loss barely made the news. To avoid gentrification, we can't simply subsidize housing costs but need to increase the spending power of the working people, by training them for higher-paid work. Community college students are now taking on debt to pay for remedial courses. K-12 education needs to provide them with these basic skills for free, before they graduate, and arm them with hard technical skills as well, so that they can use solve problems on the fly, use trigonometry, draft, and write intelligibly. If the basic workforce in a place becomes more skilled, then an industry will grow up that will create the kind of middle class jobs now lacking in so many places.